This past week we were asked to design a poster for an upcoming event in Burlington to raise funds for the recovery efforts in Haiti. The need, of course, is still critical in Haiti and the CRWRC, the event organizers, have a solid history of making a great difference to the lives of the Haitian people. Local artists and restaurants – including our client West Plains Bistro – will be contributing their work. We think it’s a worthwhile event and we thought you might like to know about it. 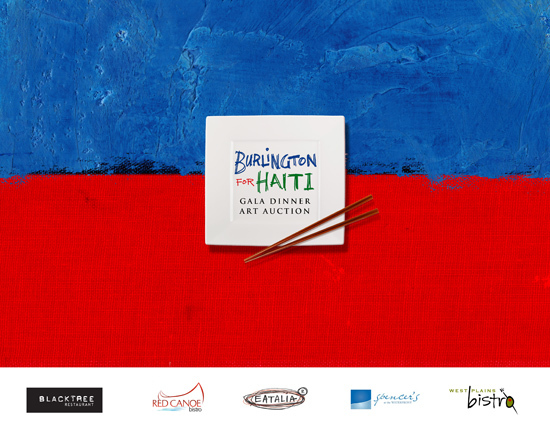 Burlington, Ontario – Burlington’s culinary community is responding in full force to the disaster in Haiti: “Burlington for Haiti: A Gala Affair for Haiti Relief,” Tuesday, March 9 at the Royal Botanical Gardens. For the first time ever, a group of celebrated Burlington chefs and local artists will be uniting efforts to pledge support and raise money for the crisis in Haiti. Burlington for Haiti will showcase the culinary talents of some of Burlington’s best chefs: Matteo Paonessa (the Black Tree), Chris Haworth (Spencer’s at the Waterfront), Tobias Pohl-Weary (The Red Canoe), Corie Rider (West Plains Bistro), and Peter Tonge (Eatalia). The dinner will start at 6:30 p.m. The evening will also include a silent auction, starting at 5:30, with art donated by area artists. One hundred percent of the proceeds will go directly to the Burlington-based Christian Reformed World Relief Committee’s earthquake response in Haiti. CRWRC has been in Haiti for more than 30 years, working alongside the Haitian people to make lasting improvements in poor communities. Since the January 12 earthquake, CRWRC has been distributing emergency food, water, and shelter to earthquake survivors and expects to be in Haiti for the next number of years rebuilding homes and restoring livelihoods. Space for “Burlington For Haiti” is limited. Only 250 tickets will be available at a cost of $150 per plate. Individual tickets or corporate-sponsored tables of eight can be purchased online at www.crwrc.org/burlingtonforhaiti. For further information, to book your tickets, or for sponsorship inquiries, please call “Burlington for Haiti” spokesperson Bert Hofland at 905-517-6375 or e-mail [email protected].